AL6XN stainless steel is a registered trademark of Allegheny Ludlum. AL6XN standard stainless steel possesses excellent general corrosion resistance with exceptional resistance to crevice corrosion, chloride-induced corrosion, pitting, and stress corrosion. The properties of AL6XN material, much like stainless steel, may be degraded by real world fabricating and handling operations. Electropolishing can be used to reverse these adverse effects and to improve the corrosion resistance of AL6XN. Further details can be found in our discussion of electropolishing. The corrosion resistance of AL6XN may also be improved by passivating the surface. Harrison Electropolishing can mechanically polish AL6XN and certify a finish as low as 4 Ra micro-inch. During the passivation of AL6XN, the surface of a part is chemically treated with a chemical oxidant. The chemical passivation treatment removes free iron and other foreign contaminants, allowing the AL6XN to perform and resist corrosion as it is engineered to do. We have performed passivation treatments on AL6XN with excellent results for a number of years. 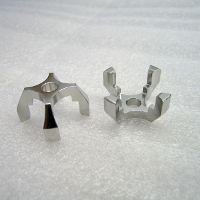 We have the capacity to passivate AL6XN components of all sizes. Harrison Electropolishing will perform chemical passivation treatments in compliance with ASTM specifications or your industry or company specific chemical passivation standard.